The first “professionally built” AR sandbox, whose physical setup was designed and built by the fine folks from the San Francisco Exploratorium, arrived at its new home at ECHO Lake Aquarium and Science Center. 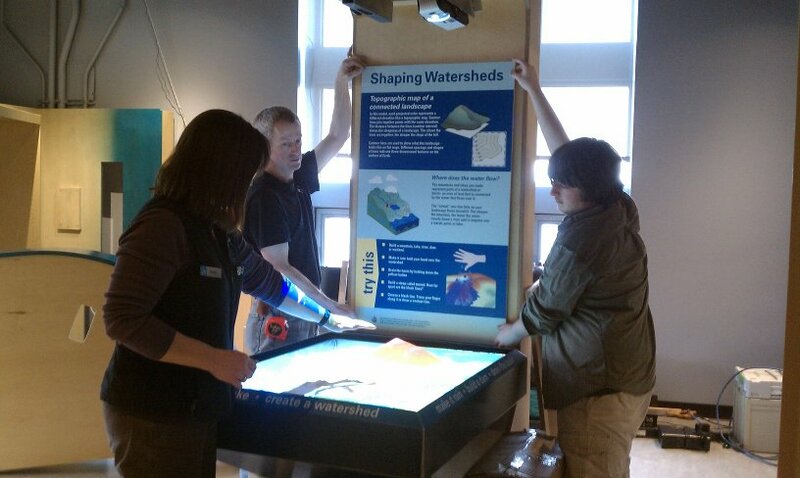 Figure 1: Picture of ECHO Lake Aquarium and Science Center’s Augmented Reality Sandbox during installation on the exhibit floor. Note the portrait orientation of the sand table with respect to the back panel, the projector tilt to make up for it, and the high placement of the Kinect camera (visible at the very top of the picture). Photo provided by Travis Cook, ECHO. 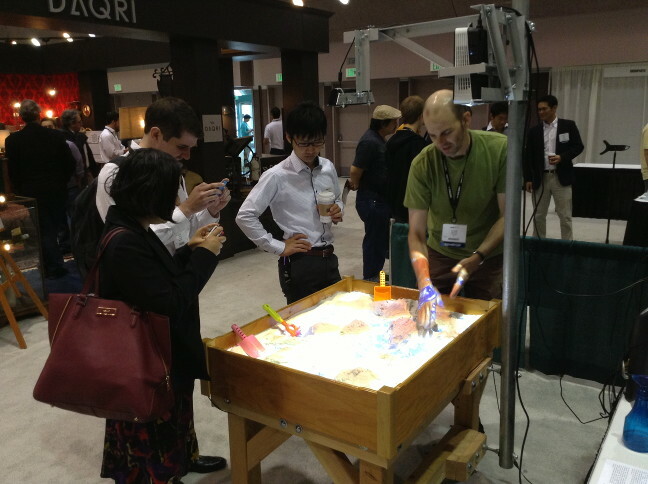 … build their own augmented reality sandboxes, that is. 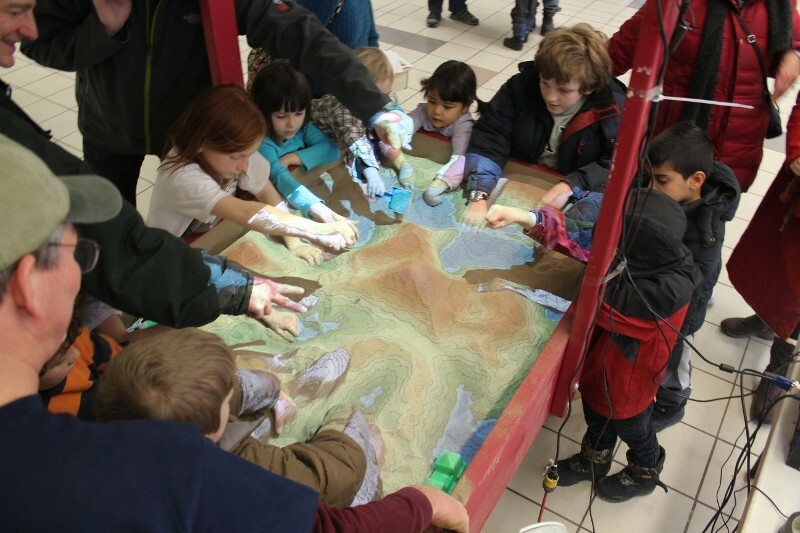 We still haven’t installed the three follow-up AR sandboxes at the participating institutions of our informal science education NSF project — Tahoe Environmental Research Center, Lawrence Hall of Science, and ECHO Lake Aquarium and Science Center — but others have picked up the slack and gone ahead and built their own, based on our software and designs. Figure 1: Augmented reality sandbox constructed by “Code Red,” Ithaca High School’s FIRST Robotics Team 639, and shown here at the school’s open house on 02/02/2013. The newest addition to my External Installations page is “Code Red,” Ithaca High School’s FIRST Robotics Team 639, who just unveiled theirs at their school’s open house (see Figure 1), and were kind enough to send a note and some pictures, with many more “behind the scenes” pictures on their sandbox project page. There’s an article in the local newspaper with more information as well. Together with Bold Park Community School’s, this is the second unveiled AR sandbox that I’m aware of. That doesn’t sound like much, but the software hasn’t been out for that long, and there are a few others that I know are currently in the works. And who knows how many are being built or are already completed that I’m totally unaware of; after all, this is free software. Team 639’s achievement, for one, came completely out of the blue. Update: And I missed this Czech project (no, not that other Czech project that gave us the idea in the first place!). They built several versions of the sandbox and showed them off at hacker meets. And they say they’re currently trying to port the software to lower-power computers. Good on them! Update 2: One more I missed, this time done by/for the Undergraduate Library at the University of Illinois, Urbana-Champaign. I don’t have any more information; but this is the YouTube video.